Israel has denied a report that it is planning to build more than 6,000 new homes in settlements in the West Bank this year. Yediot Ahronot newspaper said the government land agency plans to ramp up the number of settlement homes to coincide with a withdrawal from Gaza. But the Israel Lands Authority said the reported plan was old and never received official approval. The US-backed roadmap peace plan calls for a freeze on settlement activity. The newspaper also said the government planned to legitimise 120 unauthorised settlement outposts, also prohibited under the roadmap. All settlements are widely considered illegal under international law, although this is disputed by Israel. Under the roadmap, Israel is obliged to dismantle all outposts erected since March, 2001, when Ariel Sharon took office. The newspaper said a third of the homes would be built in Maaleh Adumim, the largest settlement in the West Bank, with a population of about 30,000. The BBC's Barbara Plett in Jerusalem says the reported project would fuel Palestinian fears that Israel is planning to leave the Gaza Strip in order to strengthen its grip on the West Bank. However, an Israel Lands Authority spokesman was quoted by Reuters news agency as saying: "This is a draft of a plan that was submitted in 2003. It was never approved." The presence of West Bank settlements is one of the most contentious issues dividing Israel and the Palestinians. The Palestinians seek the removal of all settlements and outposts in the West Bank and Gaza - areas in which they wish to establish a state. 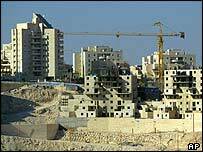 Israel maintains it is entitled to build within existing settlements to accommodate what it calls "natural growth".